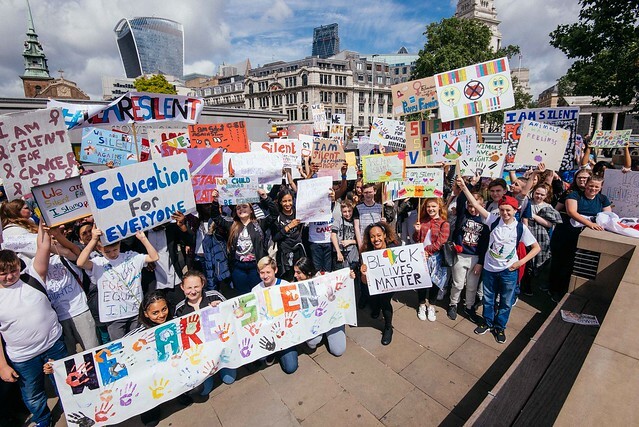 Recently over 135 Team London Young Ambassadors from Morpeth School, Jo Richardson School, The Warren School, and Broadford Primary silently marched across Tower Bridge in order to raise awareness of a variety of social issues that are important to them. The ‘We are Silent’ campaign is delivered by WE and encourages young people to protest silently for children around the world whose voices are not heard. Team London Young Ambassadors are a part of the Mayor’s volunteering programme for schools. The issues that the students were raising awareness for ranged widely from Black Lives Matter to Women’s rights and Xenophobia. Passers-by couldn’t help but stop and take photographs as the students held their banners high. Following on from their We Are Silent March the Young Ambassadors then continued their protest inside City Hall grabbing the attention of all those in the Mayor’s office and helping to give a voice to those who need it most.